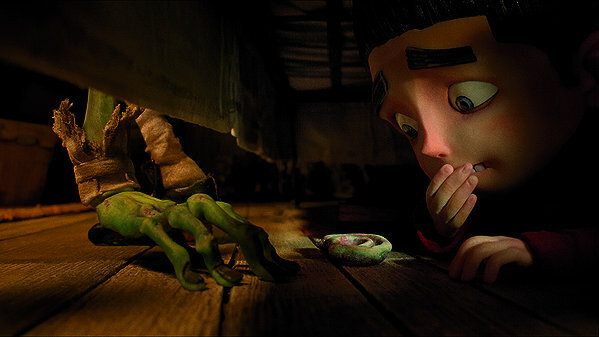 Laika, the studio behind stop-motion hit “Coraline,” have done it again with “ParaNorman,” another tale of a child who doesn’t fit in. This time, the protagonist must use his unique abilities to save his town and end a centuries-old curse. Norman (voice of Kodi Smit-McPhee) can’t catch a break and has been ground down to a sort of resigned weariness. He’s teased and bullied at school, his own father is constantly trying to change him — the only people who are nice to him are the ghosts he can see all around town. Well, the ghosts and Neil (voice of Tucker Albrizzi), a relentlessly optimistic fellow bullying victim from school who is so determined to be friends that he has almost worn down the firmly-introverted Norman. Things are bad enough, but they get worse: Norman learns from his weird Uncle Prendergast that his ability to speak to and understand the dead makes him next in line to hold off a curse that will destroy the town. Norman has to perform an annual ritual at the grave site of a notorious witch who was executed in town centuries before (and now provides tourist fodder). When the school bully interferes with Norman’s attempt to fulfill his duty, the dead begin to rise. This is a movie which, in the grand tradition of children’s entertainment, has something for all ages. It’s probably too scary for the very young set, especially if they’re afraid of zombies (of which there are seven), but parents of slightly older kids with a fondness for scary movies will likely enjoy it as much as their kids. The film melds old tech with new, using 3D printing and CGI technology to help with traditional stop-motion techniques. The result is stunning — characters have wide ranges of expression and motion, and the seams, rods, and strings necessary to create the various poses and effects are invisible. Combine this with spot-on vocal performances, and it’s easy to forget that you’re watching a technological marvel and just get caught up in the story. Like a lot of kids’ movies, “ParaNorman” has a number of teachable moments, but they’re ones people of all ages can learn from. This is a film that deals with issues of bullying, mob mentality, parents who are mean to their kids because they’re worried about them, and the misunderstandings created by fear. Even better, it handles them surprisingly well. A lot of adults would really benefit from the lessons in this movie, especially during an election year. “ParaNorman” is a movie for people of almost all ages. Those who don’t like zombies, corpses, mobs with pitchforks, or ghosts with scary powers should definitely stay home. Everyone else should definitely take a look at it. And be sure to stay after the credits for a neat time-lapse behind-the-scenes video!